emmatree: Awake, Awake - OH! I am up - cannot sleep. Looking for a picture under which to type, I found this. 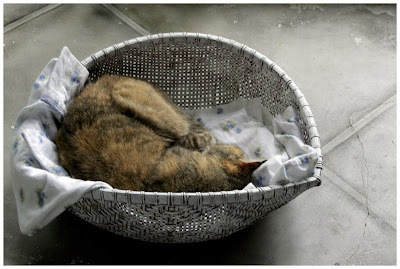 Another Maggie in a basket photo. Right now she is nestled on the bench at the foot of my bed. caressing my cheek like the hand of a lover. ironic since the sound of real rain lulled me to sleep earlier. laundry needs folded, a wedding down the street, lock on my front door is broken, need to buy ice and coke and bread and cat food, field of dreams, remember to sign new car insurance papers, remember to look for new car insurance papers - where did i put them? - can i drive them over monday?, why hasn't the letter about the art show shown up?, it's too hot, it's too chilly, my ear is hurting - does that mean i am getting sick?, is it the flu?, of course rio over chicago, new dog next door, rain again, out of season tulip tree blossoms, paper whites breaking ground, need to photograph green high heels, what has happened to rachel lucas?, i wish i'd talked those little girls into peeping over the fence for a photograph, the american revolution, baseball season is almost over, do the cowboys play tomorrow?, should i take something to help me sleep?, katie's wedding pictures, what is the student edition of photoshop and why is it so much cheaper than regular photoshop?, film for julie, that funny picture in the photoshop disasters blog, emma is better, my mother, i drank too many cokes today, i hope it's not still raining tomorrow, maybe i should turn on the fan, i hope i don't catch katie's cold - she said robert was now coming down with it so it's contagious, maybe that's why my ear is hurting, who's walking around upstairs? - he or she can't sleep either, why does it seem so light out - is it the moon or did heidi leave her back porch light on?, i hate that light, why did my mother switch her phone service to suddenlink? - the caller id is still wrong, i don't want to deal with them, maybe i should just go to the lab and work on photos, hardly strictly bluegrass, the big lebowski - i need to watch it and return to netflix; i've had it a month, i need to call lulu, i need to make get well cards for emma and sharon, i should start making christmas cards, i need to clean the house, the bathroom cabinets need re-painted, i am still itching from whatever i am allergic to out in the yard, should i cut my hair?, i am clenching my jaw - no wonder my ear hurts, maybe i should play tripeaks - that always makes me sleepy, i want some ice water, maggie to the vet, is michael coming over?, that stupid key stuck in the door, restless legs syndrome, mark steyn on hollywood & roman polanski, blueberry eggos, is that lasagna in the fridge still good?, if i had milk i could eat some cheerios, maybe i'll watch craig ferguson on youtube, maybe i should just read, why did i let my camera battery get so low?, i need to pay that dr. bill - where did i put it, it's way overdue, maybe that's what all the unknown phone calls are about, i'll bet they are, it's really way overdue, where is it?, i need to figure the utilities for rbl - they're way overdue too, hydrangea trees, that 5 year old kid shot that alligator; too funny, i should have gone to blue moon, that dog molly is really cute in her lifejacket, i need to get a halloween costume. Reading the news is too frustrating. I have had nights just like this. Haven't we all? It's quite amazing how much useless information our brains can hold on to, isn't it? And then keep us up at night, tossing and turning, worrying about these things. And because of you, I have spent quite a lot of late night time watching Craig Ferguson on You Tube too! I'm glad he won last night....the useless things that go through his brain make him the funniest guy on tv! Make sure you relax and take a wonderful nap today to catch up. PS I think us artists have busy, busy minds that never stop...sensory overload. Oh yeah, I forgot to thank you for your compliment of my new banner photo. Coming from an artist photographer, it's high praise. Thanks! Oh girl, that sounds like a tossing turning night for sure! How to quiet the mind so we can sleep at these times.... it seems as though when we get quiet enough, that is when these thoughts have space to rise. Wishing you a restful and sweet sleep. I love the thought of white flowers caressing. Yes, isn't always late at night lying in bed that the gremlins begin to poke your sides? Damn them! A school history book will make you drowsy! Oh, so much on your mind??? Oh dear, I am behind on things, aren't I? Reading this made my head buzz. I know just how this feels. GAH!! It was fun to read yours, though. Like a little peak in your head.